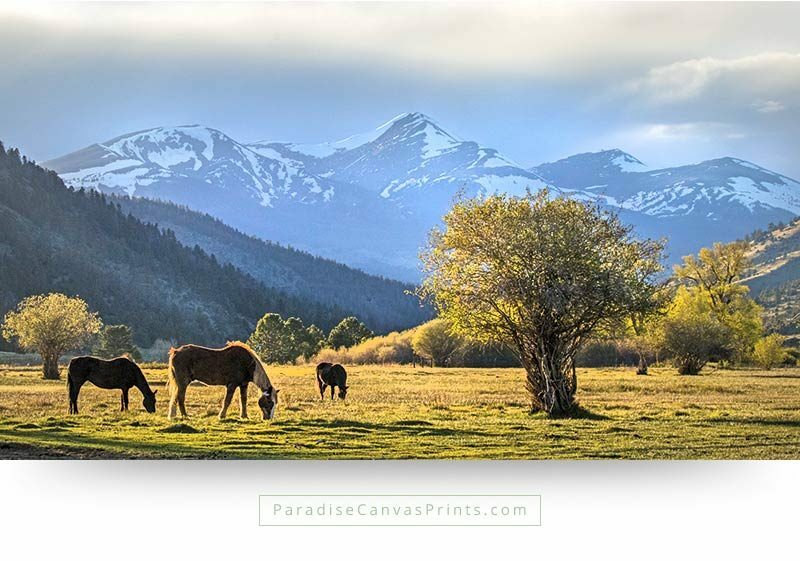 Beautiful horses enjoy the warmth of the first sun in spring, after a harsh winter in Colorado. The melted snow has turned the grass green, which is a treat for these horses, after chewing on hay for several months. Freedom, adventure and splendor… When we explore the wilderness, instead of staying in the safety of the cities, we find treasures everywhere. Like this beautiful scene, in the mountains of Colorado. The sun blazes her light unto the landscape, that explodes with color and abundant life. Only the brave find these spots. There is a beauty high up in the mountains of Colorado, that we can’t see when we stay down in the valleys. I drove up here with my 4WD, early in the morning and was welcomed by this stunning scene. Sheer beauty, in the heart of the Rocky Mountains. John Denver sang that he had seen fire in the sky. This is it! 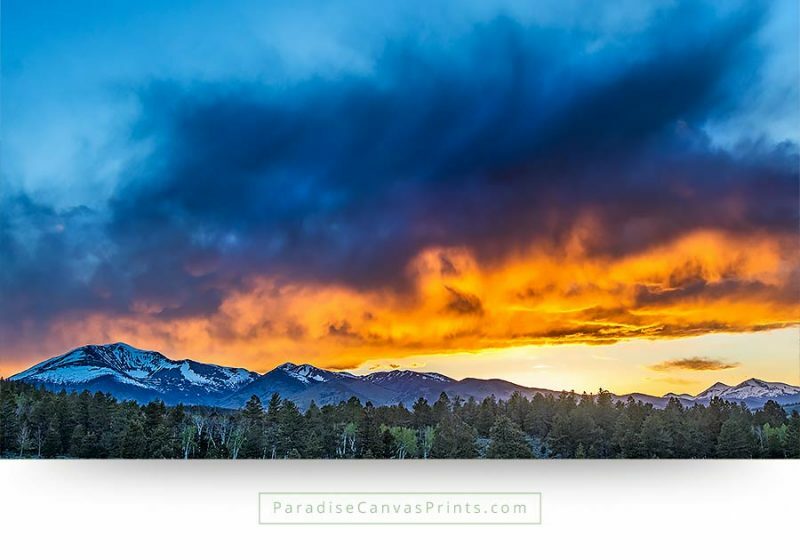 The sunset casts a fiery light on the clouds, over the mountains of Colorado. It’s a real spectacle! 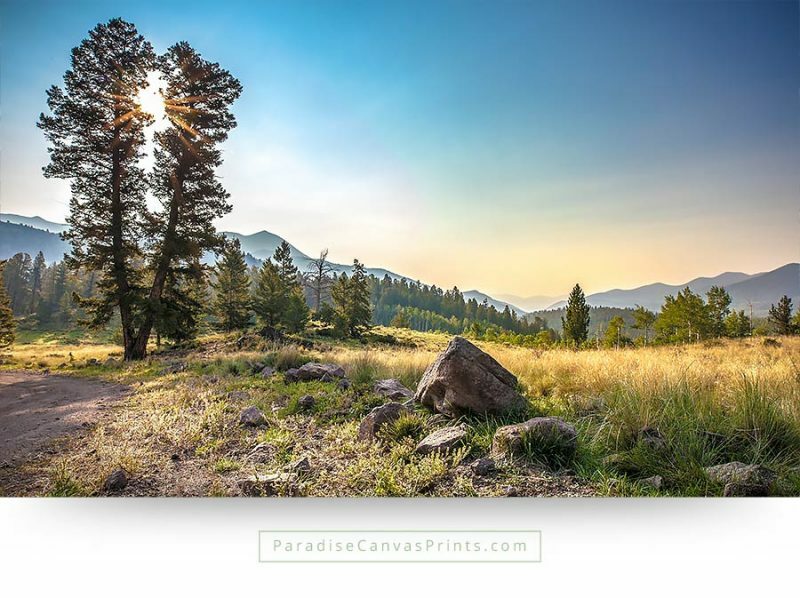 With this canvas print you can enjoy this wonder of nature in your home. This magnificent image shows the stunning beauty of nature. 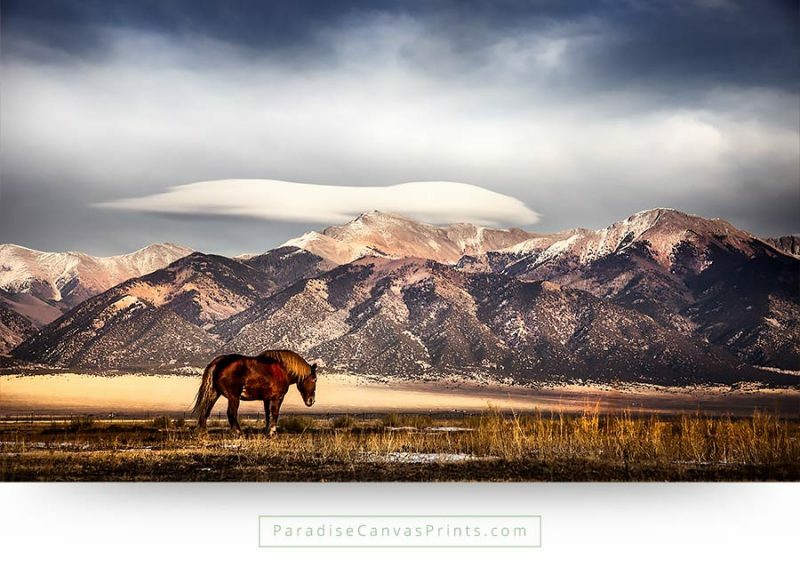 The dramatic clouds over the breathtaking mountains create an impressive backdrop for the ranch horses. 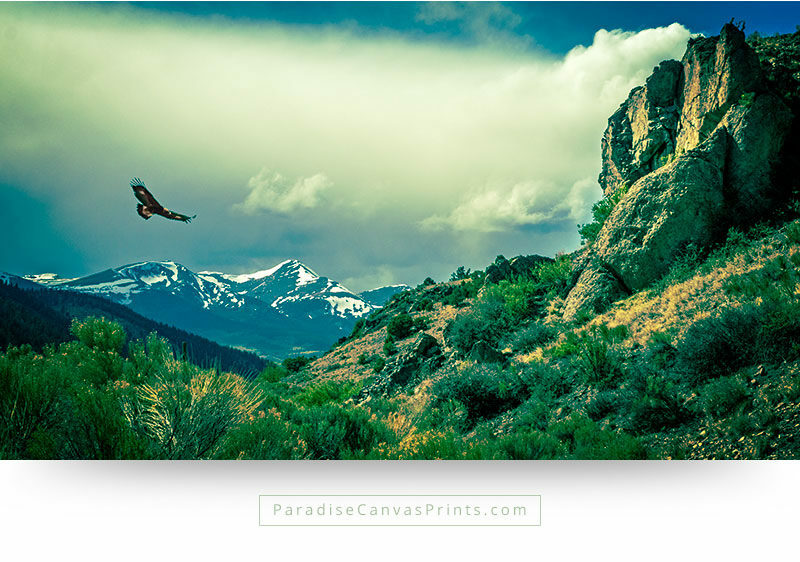 Majestic birds of prey like the Golden Eagle have disappeared in many parts of the USA. In the Bonanza valley of the Rocky Mountains however, they still hunt for rodents and can be seen soaring over the meadows and the rocks. This fascinating image captures the adventurous beauty of the far west. 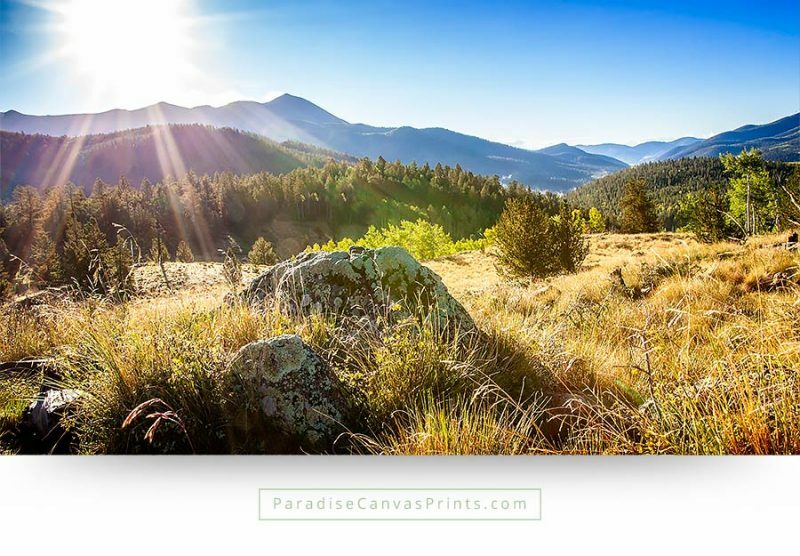 Bring the beauty of the American Wild West into your home with this magnificent and unique Colorado Wall Art. Sometimes the best nature photographs come as gift. 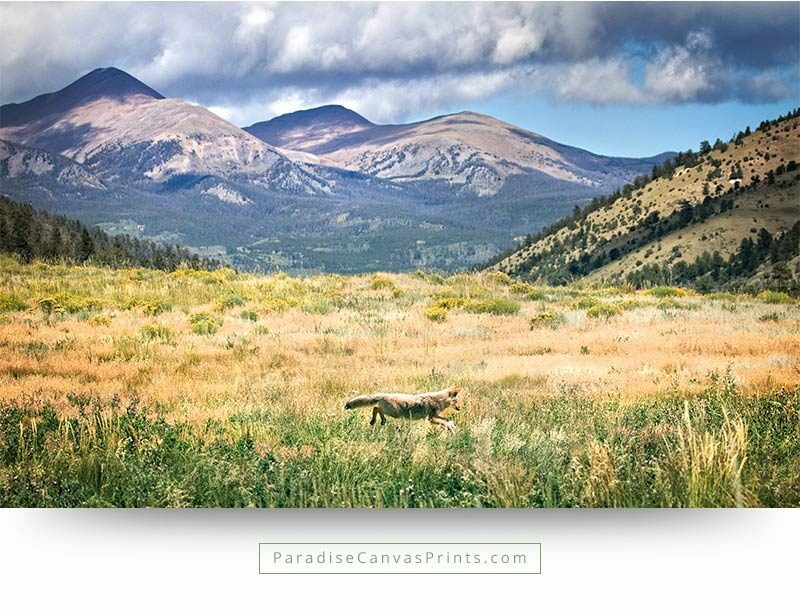 This unique image of a hunting coyote in the mountains of Colorado is such an example. One day I was sunbathing on a hill, when I suddenly saw something in the corner of my eyes. I turned my head and to my surprise, I saw a coyote nearby, hunting playfully in the valley. He was completely relaxed and careless, and wasn’t aware of my presence. I quickly ran to the car, grabbed my wildlife photography equipment and was able to take a few amazing pictures of this wonderful animal. 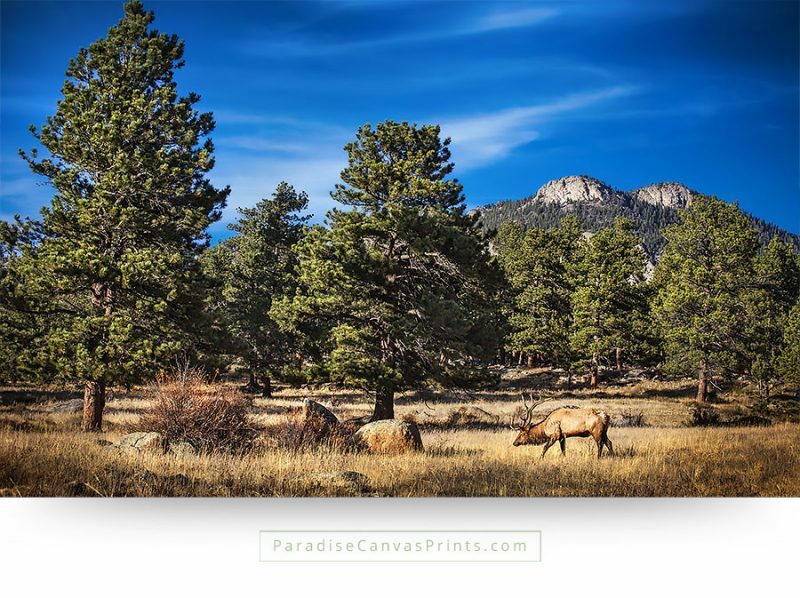 I believe this photograph would look great as a wildlife canvas print, in your home or office. Bring paradise into your home! Every year thousands of hunters venture out into the wilderness of Colorado, to kill wildlife. But in Rocky Mountain National Park the wild elk are safe and can be observed by those who leave their guns at home and only shoot with their photo camera. 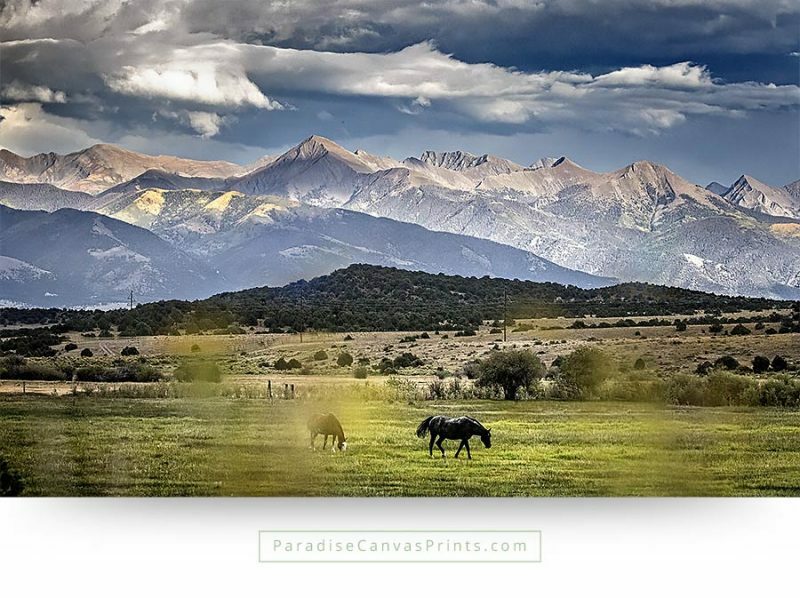 A canvas print of a big horse, walking gently in the majestic San Luis Valley in the state of Colorado. 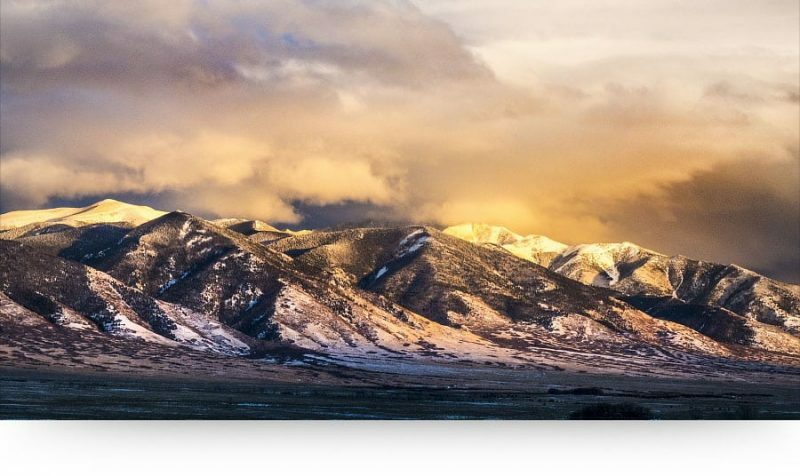 The mountain range in the background is called Sangre de Cristo, meaning ‘Blood of Christ’ because they turn red at sunset. 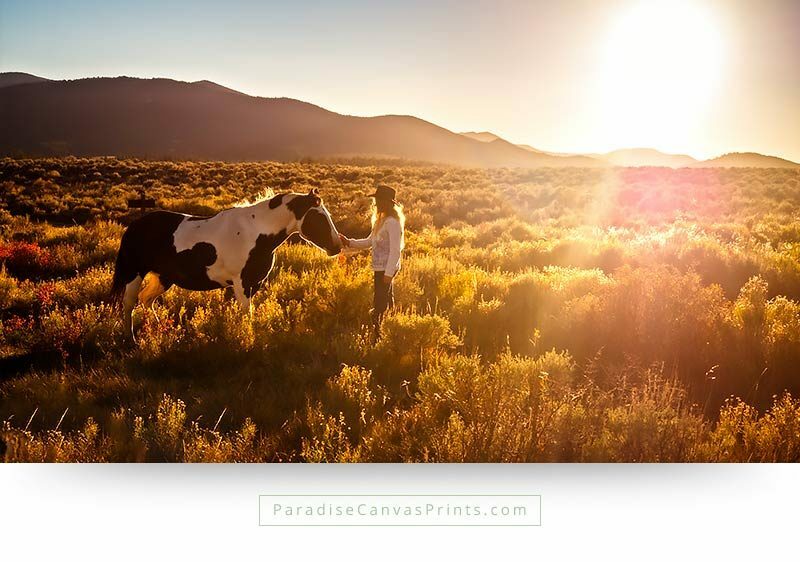 A canvas print of a girl with a horse during a beautiful sunset in the mountains of Colorado. This horse print on canvas shows the special bond that can exist between a human being and a horse. 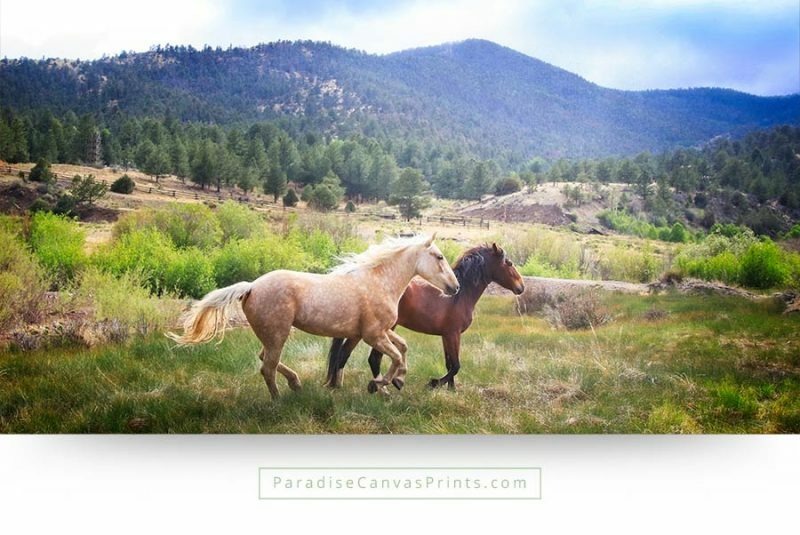 Two wild mustangs are running free in the spectacular landscape of the Rocky Mountains in Colorado.